I first heard of Spark in late 2013 when I became interested in Scala, the language in which Spark is written. Some time later, I did a fun data science project trying to predict survival on the Titanic. This turned out to be a great way to get further introduced to Spark concepts and programming. I highly recommend it for any aspiring Spark developers looking for a place to get started. Today, Spark is being adopted by major players like Amazon, eBay, and Yahoo! Many organizations run Spark on clusters with thousands of nodes. According to the Spark FAQ, the largest known cluster has over 8000 nodes. Indeed, Spark is a technology well worth taking note of and learning about. 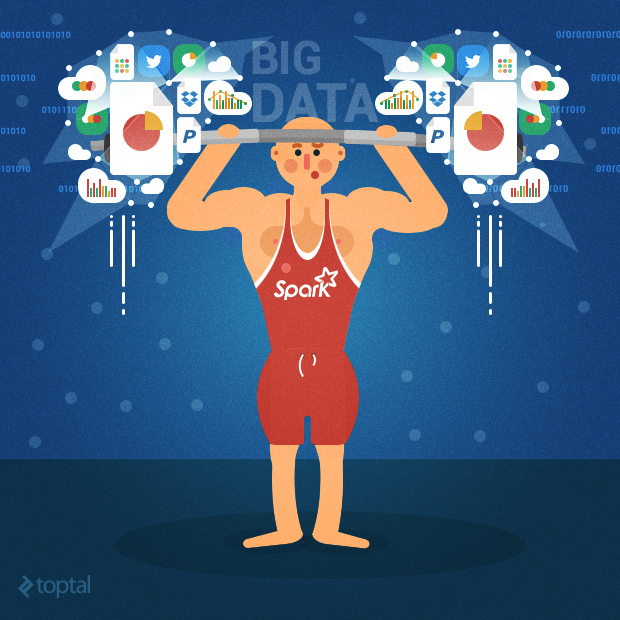 This article provides an introduction to Spark including use cases and examples. It contains information from the Apache Spark website as well as the book Learning Spark - Lightning-Fast Big Data Analysis. Spark is an Apache project advertised as “lightning fast cluster computing”. It has a thriving open-source community and is the most active Apache project at the moment. Spark provides a faster and more general data processing platform. Spark lets you run programs up to 100x faster in memory, or 10x faster on disk, than Hadoop. Last year, Spark took over Hadoop by completing the 100 TB Daytona GraySort contest 3x faster on one tenth the number of machines and it also became the fastest open source engine for sorting a petabyte. Another important aspect when learning how to use Apache Spark is the interactive shell (REPL) which it provides out-of-the box. Using REPL, one can test the outcome of each line of code without first needing to code and execute the entire job. The path to working code is thus much shorter and ad-hoc data analysis is made possible. The Spark core is complemented by a set of powerful, higher-level libraries which can be seamlessly used in the same application. 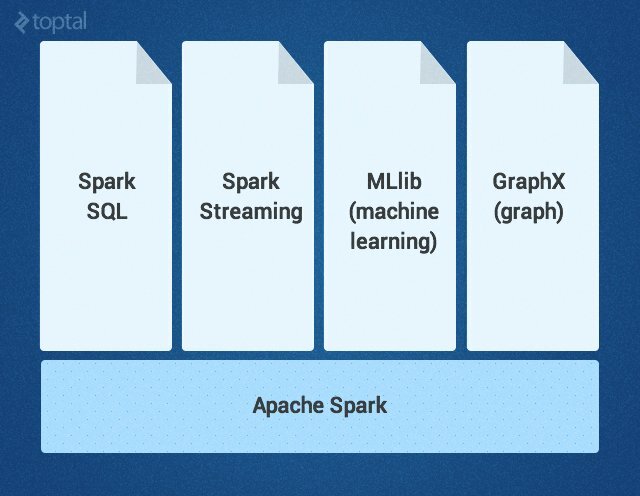 These libraries currently include SparkSQL, Spark Streaming, MLlib (for machine learning), and GraphX, each of which is further detailed in this article. Additional Spark libraries and extensions are currently under development as well. Spark introduces the concept of an RDD (Resilient Distributed Dataset), an immutable fault-tolerant, distributed collection of objects that can be operated on in parallel. An RDD can contain any type of object and is created by loading an external dataset or distributing a collection from the driver program. Transformations are operations (such as map, filter, join, union, and so on) that are performed on an RDD and which yield a new RDD containing the result. Actions are operations (such as reduce, count, first, and so on) that return a value after running a computation on an RDD. Transformations in Spark are “lazy”, meaning that they do not compute their results right away. Instead, they just “remember” the operation to be performed and the dataset (e.g., file) to which the operation is to be performed. The transformations are only actually computed when an action is called and the result is returned to the driver program. This design enables Spark to run more efficiently. For example, if a big file was transformed in various ways and passed to first action, Spark would only process and return the result for the first line, rather than do the work for the entire file. By default, each transformed RDD may be recomputed each time you run an action on it. However, you may also persist an RDD in memory using the persist or cache method, in which case Spark will keep the elements around on the cluster for much faster access the next time you query it. Spark Streaming supports real time processing of streaming data, such as production web server log files (e.g. Apache Flume and HDFS/S3), social media like Twitter, and various messaging queues like Kafka. 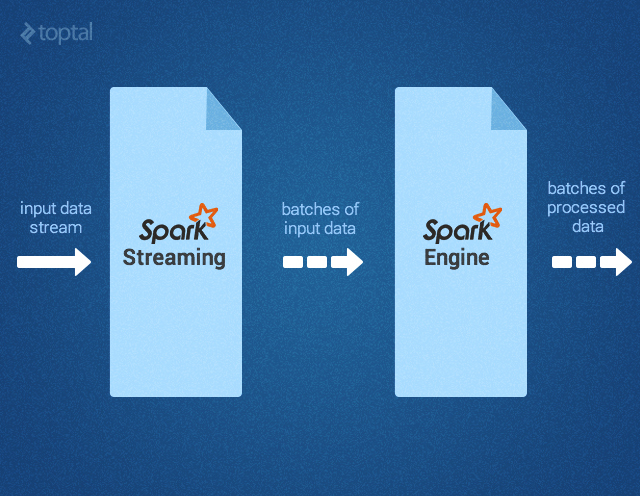 Under the hood, Spark Streaming receives the input data streams and divides the data into batches. Next, they get processed by the Spark engine and generate final stream of results in batches, as depicted below. The Spark Streaming API closely matches that of the Spark Core, making it easy for programmers to work in the worlds of both batch and streaming data. MLlib is a machine learning library that provides various algorithms designed to scale out on a cluster for classification, regression, clustering, collaborative filtering, and so on (check out Toptal’s article on machine learning for more information on that topic). Some of these algorithms also work with streaming data, such as linear regression using ordinary least squares or k-means clustering (and more on the way). Apache Mahout (a machine learning library for Hadoop) has already turned away from MapReduce and joined forces on Spark MLlib. NB: This article was first featured in Toptal Engineering Blog.